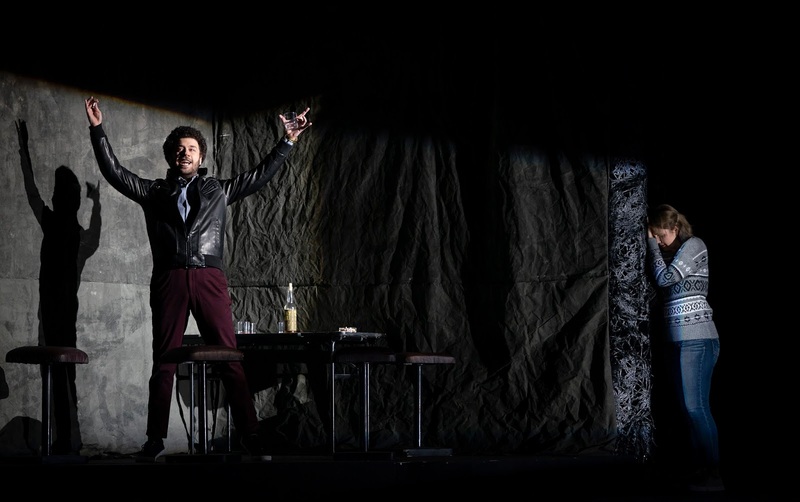 For the non-expert operagoer, Rigoletto is blessed with a straightforward plot when compared with some other works. 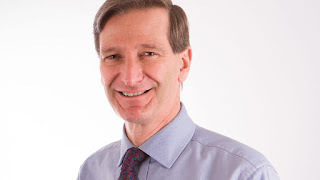 A good choice for NI Opera’s director Walter Sutcliffe in his second year in charge. The titular character of this soap opera is a court jester, a recent widower who is unimpressed with his Duke’s handsy way with women and serial adultery. Along the way the jester is cursed. His daughter Gilda falls for a student who woos her but (spoiler alert!) turns out to the Duke, and despite witnessing his womanising ways she tragically intervenes in a vengeful plot to kill her true love, completing the curse on her father. Men dominate both the opera, in terms of the robust male chorus, and the women who are written as objects of affection with little agency of their own. The inappropriate imbalance is not disguised and the audience will notice a string of scenes that build on this theme. The Ulster Orchestra play Giuseppe Verdi’s dark and muted score with wind and brass over low register strings. 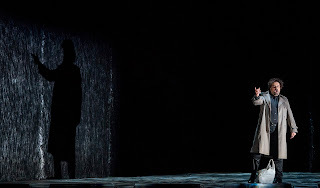 Space is made for Francesco Maria Piave’s libretto, which is sung in its original Italian with English surtitles on too-small screens hung to each side of the stage. Nadine Koutcher plays Gilda as an ingénue dressed at first in fluffy pyjamas, and later in a jumper stolen from Sara Lund’s The Killing wardrobe. Her fine soprano voice rises to hit the top notes in Act III’s quartet Bella figlia dell’amore. Baritone Sebastian Cantana plays her hunchback father, the jester who neither smiles nor tells jokes, but carries the plot as he acts out his hopes and fears. Fleur Barron put in an excellent performance as Maddalena, an assassin’s sister and bait for his targets. 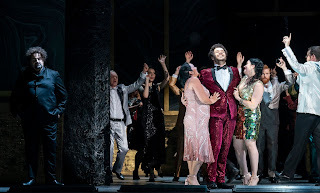 Davide Giusti found his feet in the role of the vain and brash Duke by the end of the first Act and delivers the catchy misogynist canzone La donna è mobile (“Woman is flighty / Like a feather in the wind / she changes her words / and her thoughts! / Always miserable / is he who trusts her / he who confides in her / his unwary heart!”) in an understated fashion that underscores that this is belief and not just his boast. Northern Ireland singers dominate the chorus and some of the smaller named parts, demonstrating that NI Opera’s talent development programme is delivering results. The scale and consistency of the creative design is beyond most local theatre productions. Kaspar Glamer’s clever set fills the height of the Grand Opera House, with each side revolving to spit out and then swallow up bedrooms, kitchens, forests and bars. Along with Wolfgang Goebbel’s low-slung lighting design, the staging of NI Opera’s Rigoletto is as moody as the storyline, though at times the heads of the cast remain in shadow, denying the audience of facial expression. 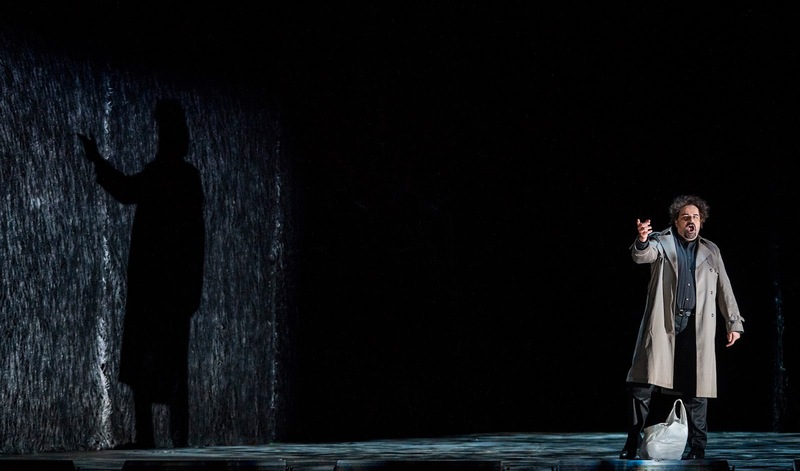 Rigoletto is a feast for the eyes and ears. 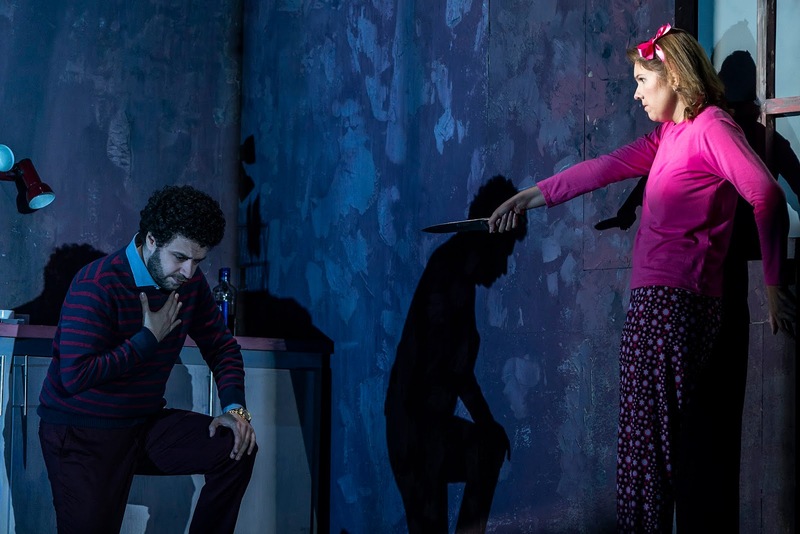 While it lacks the grotesque spectacle of 2015’s Turandot and the humour of February’s The Threepenny Opera, Rigoletto is one of the most accessible works that NI Opera have produced in recent years. It plays on alternate nights this week in the Grand Opera House. There’s a free but bookable talk in the Baby Grand before some performances. In retrospect it’s pretty shocking to realise that I emerged from primary and secondary education in Northern Ireland without being taught any Irish history. A mention of the Belfast Blitz and a factoid that Cromwell had travelled through Lisburn were the only real local insights imparted by the time I opted out of history lessons at the end of third year. A visit to the Doagh Famine Village in the summer of 2011 was the first time I’d encountered the Great Famine in any detail. Cahoots NI has adapted Marita Conlon-McKenna’s 1990 children’s novel Under the Hawthorne Tree and brought it to life on stage in an eight-handed musical tale that follows the journey of three siblings who try to escape the disease and death that engulfs their town when the potato blight in the late 1840s. It’s an aptly dark tale of bravery in the face of danger, stamina overcoming weakness, and an expedition of hope as Eily, Michael and Peggy trudge towards distant relatives who live far away on the coast. Repeated elements of Carlos Pons Guerra’s choreography establish the children’s young ages despite the use of adult actors. 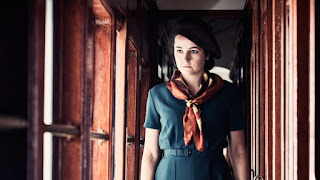 Maeve Smyth thrives in her role as the protective eldest daughter, the one who keeps hold of common sense. 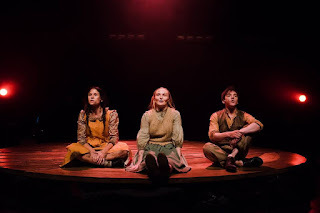 Together with Philippa O’Hara and Terence Keeley, the main cast’s harmony singing is superb, accompanied by a live band who sit around the circular raised stage. Cahoots’ trademark magic is more subtle than usual, but nevertheless can be seen in the prop-tastic trapdoors and in James McFetridge’s sculpted lighting that allows characters to appear on stage out of nowhere. Words and music penetrate the auditorium with clarity and Garth McConaghie’s hummable score shifts from Irish trad to gospel to lament as each scene requires. Paul Bosco Mc Eneaney has created a show whose message will be understood and should be heard right across Ireland … and beyond as the 170 year old story has much resonance with contemporary migration journeys. Under the Hawthorn Tree is a fitting piece of theatre that illuminates an important part of Irish history. While the subject matter is serious, the 65 minute performance has pace and moments of levity that will keep youthful audiences engaged without being overwhelmed by facts and education. There are daytime performances for schools and weekend shows for families in The MAC until 7 October.